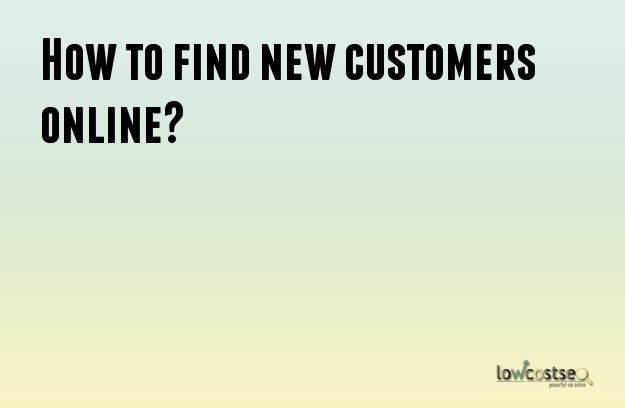 How to find new customers online? Starting a new business is an exciting time but there are a huge number of things that you need to take care of. Among them, marketing will be an important task. After all, you will be seeking to increase the number of customers you serve. Of course, the internet is one of the best places to seek out targeted customers for your business. Unfortunately, if you are new to the world of internet marketing, you will find that it is by no means an easy process. Here are a few tips that can help you make the most of it. Your customers are certain to be on one social network or the other. You will need to do a bit of research to determine which social media networks are being used by the majority of your customer base. It will be a worthwhile investment of your time as you can use the information to create profiles in those networks. By being on the same social networks, it will be easier for your business to connect with potential customers. Facebook is well known for its Groups feature. You can leverage these groups to your advantage by becoming a member of them. Opt for those groups which are relevant to your business and have potential customers as members. Once you become a member yourself, you should start building up relationships with the various members. Soon, you will be able to slowly push your products through recommendations. Another powerful method of getting new customers through the internet is by starting pay per click marketing campaigns. PPC campaigns can deliver targeted leads directly to your website or product page for a quick sale. You can certainly place PPC advertisements on Google with the help of Google AdWords. However, you can also benefit from using the PPC facilities provided by Facebook. Make sure that you target your customers when using PPC campaigns so that you can get the best results possible. Email marketing is a good way to increase your sales, convert leads and bring back past customers. In order to do so, you will first need to gather the emails of your customers. There are various ways you can do so. You can ask for the email from your customers naturally when they are checking out. It is quite easy when you are running an online store. For brick-and-mortar stores, you can request your cashiers to take the emails from the customers whenever possible. Alternatively, you can provide valuable content to people in return for their email addresses. Another simple tactic would to be to place an email opt-in widget on your website. Blogs play a very important role in digital marketing. Not only it is helpful for search engine optimization, it can also help out the customers who visit your site. If people find your content to be useful, they will be more likely to make the relevant purchase from your website. Moreover, they will keep coming back for the blogs.